Having your deck or fence painted or stained protects them from moisture and harmful UV rays. Because decks are exposed to the elements and foot traffic, they need to be properly maintained every couple of years. There are many colors and products to choose from. Some stains are semitransparent, allowing the woods natural grain to be visible. Others are solid and give a painted appearance. Paints can be applied over stains but stain cannot be applied over paint. Stain soaks deep into subsurface gaps in the wood that would otherwise absorb moisture. 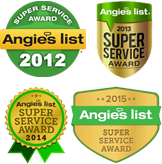 This is good because most stains contain preservatives that protect the wood against mold and wood rot. In certain instances decks will need to be stripped of the current coating before new one can be applied. 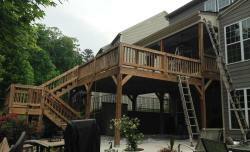 There are many methods of application for decks and fences. Which method of application we use, spraying, brushing, or rolling depends on the particular job. Obviously, a well prepared surface will provide the longest life for the coating. This means a clean, dry, surface free of contaminants is needed to ensure a long lasting paint or stain job.